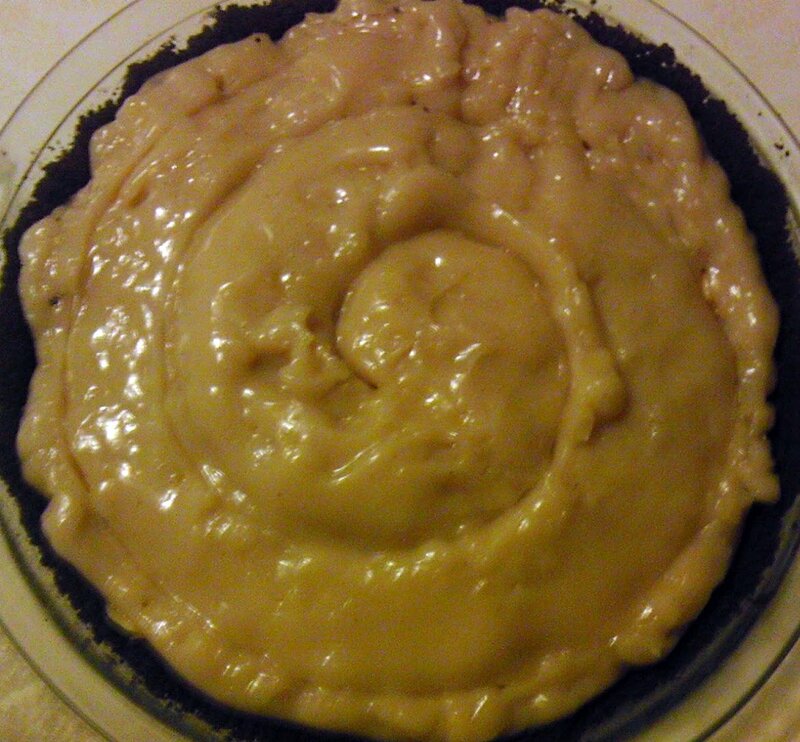 Last night I made a vegan banana pudding pie for Pi Day, and despite the quality of the pie as a pie, I was left wondering if I had gotten the pudding texture right. I had anticipated something a bit looser, though gelled. This was next to Jell-O, and when you put your fork through it to take a bit it pushed out the banana underneath, or wiggled off the crust. The composition was a half cup of corn starch in a slurry with a half cup of soy milk. The recipe calls to bring 1 1/2 cup soy milk, 3/4 soy creamer, and 1 cup granulated sugar to a simmer; stir the slurry and add to pot, whisking for five minutes. Then you add the pot to a bowl with 1 tablespoon earth balance, and 1 teaspoon vanilla extract, whisking until cool (put bowl over cold water). As I do not have a nylon whisk, I had to use a small, heat-proof flat spatula to whisk in the pot. Per prior experience with corn starch slurry, I gradually poured it in while stirring instead of "adding" it. The pudding was not cold, but the recipe indicated this would take about ten minutes, as opposed to the three or four it actually took. First, how would one describe the proper texture of a banana pudding pie's pudding; what similar recipes have a similar stiffness, texture, tooth? Second, were my expectations wrong, or my recipe and technique? Last, could I tweak the amount of corn starch, or perhaps substitute in part or whole a different thickener to get a more appropriate, giving tooth? Is it perhaps that the problem wasn't that the pudding was too gelled, but that the crust didn't give enough traction (crumb'ed oreos and 4 tablespoons earth balance melted and pressed into the shell and par-baked 10 minutes), or perhaps the bananas were too few (three small on a 9" shell) or should have been cooked somewhat? It is difficult to give an authoritative answer because who knows what a "typical" pie might be like. It might be different for every person you talk to. I will therefore answer just for myself. All of the made-from-scratch pudding pies that I have made have been very similar- a lot of sugar and fat and some starch to make the gel. Usually recipes also call for egg yolks which also help with binding but make the pudding a little more custardy instead of just a gel. The texture should be sliceable so that the sliced edges sag but don't flow. I have had pies that have to be scooped out which, while perfectly delicious, isn't as nice a presentation. On the other side of the spectrum is what you have- rubber- which is a great presentation when cutting but not much fun to eat. Gradually adding your corn starch slurry is always a good idea. Often the starch is mixed with the sugar to make sure it is evenly dispersed and then added to the liquid. As long as you didn't have clumps your technique here was fine. I don't think your expectations of a banana pudding pie or your technique are wrong. What I think is slightly wrong is your expectations for this recipe. It's "wrong" to call something a "take on a southern classic" that uses soy milk and organic margarine. The milk fat and egg yolks in typical recipes do a lot to make a smooth, custardy pudding. Doing this with different fats and soy milk could be good but I would expect it to be different. The bananas don't have to be precooked- that would be horrible, I haven't used earth balance but if it behaves like normal margarine then your crust sounds like it is pretty normal. The number of bananas also sounds reasonable. You want a good layer but not so much that the pudding can't work in to bind it together. Reducing the amount of corn starch a little should make the filling softer and more to your liking. You could try adding a little more fat which will also soften the pie. In the end though, I wouldn't expect a typical texture of a pie that is made completely of non-typical ingredients. Not the answer you're looking for? Browse other questions tagged pie thickening pudding cornstarch or ask your own question. How to make a pie crust out of plantains? Why won't my pudding thicken up? How did I screw up this rice pudding recipe?